Though the walled city is now just a memory preserved in post-apocalyptic photos and a few scant minutes of video footage, it remains an archetype for lawless urban dystopias. Unowned, ungoverned, ruled by gangs and avoided by police, surviving in the most crowded place on Earth, which was described by South China Morning Post as “a fetid slum, crawling with rats and dripping with sewage,” was no easy feat. Kowloon Walled City has a strange history. What was once a simple trading outpost later became a Chinese military fort that, unlike the surrounding area, was not ceded to the British in the 99-year lease of Hong Kong following China’s defeat in the First Sino-Japanese War. When political refugees from China began pouring into Hong Kong starting in the 1950s, the fort ballooned into more than 300 towering buildings that were physically distinct but interconnected thanks to complex, unplanned construction cycles. The walled city eventually stopped expanding when the urban behemoth reached 500 structures. As the 99% Invisible podcast explains it, you’d have to cram the entire population of Texas into Manhattan in order to achieve the same population density. That’s 268,818 square miles worth of people jammed into just 22 square miles, or, in the case of Kowloon Walled City, nine people for every 1,200 square feet — though the average person had only 40 square feet to call their own, thanks to the numerous industrial workshops and commercial facilities that were also housed in the walled city. You can see for yourself how tight a fit it would be on the MapFight site. In the early 1990s, the government of Hong Kong evicted the tens of thousands of residents, then spent more than a year demolishing the site. In April 1994, Kowloon Walled City had been completely wiped off the map. 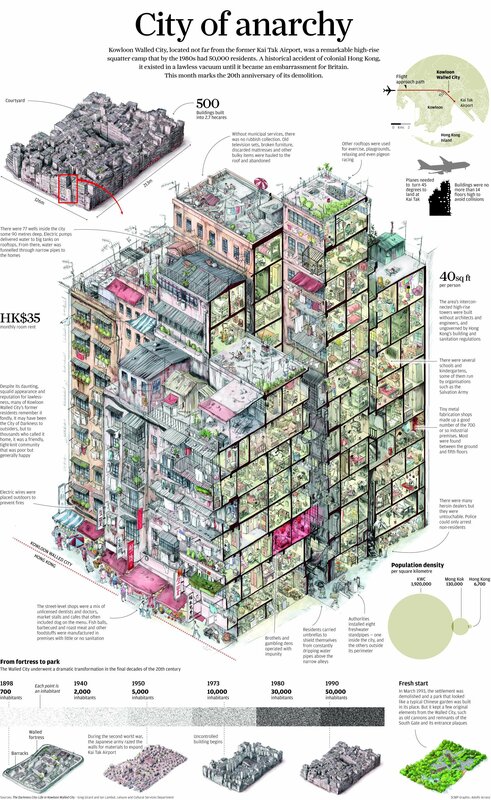 Could you survive in Kowloon Walled City, a place without running water or plumbing, swarming with brothels and gambling dens, and nearly no natural light and air? Possibly, if you followed seven rules. With no oversight by either the British or Chinese governments, no police presence, and no landlords, Kowloon Walled City should have descended into anarchy. Instead, the triads took over. These organized crime syndicates were extremely powerful in Hong Kong at the time, with multiple branches such as the 14K and the Sun Yee On, which comprised tens of thousands of members. In lieu of traditional rent, residents paid protection money to the triads, which further profited by setting up gambling dens, drug safe houses, and brothels within the walled city. If you wanted to thrive rather than just survive — especially if you were engaging in any sort illegal activities — your best bet was to get in good with the gangs. Once you were addicted, there were few, if any, resources to help you get off the drugs. Better to avoid them at all costs. Though neither the British nor the Chinese governments provided electricity to the walled city, residents managed to improvise, supplying the buildings with illegal power “tapped somewhere in the outer world” via a network of dangerous cables “that are disconnected and replaced with new cables again and again,” according to the 1989 documentary, Kowloon Walled City. The cables hung in thick, erratic hanks above standing water, and were continuously bathed in dripping runoff from above. Why the entire place didn’t go up in flames is a mystery. As South China Morning Post reported in 2013, the walled city housed at least 700 industrial and manufacturing businesses. These businesses were operating illegally, outside the reach of government and health inspectors. Many of them produced food such as noodles and spring roll wrappers, the workers toiling in unsanitary conditions for 12 hours a day, seven days a week. Rats were frequently found within food production sites in the walled city. And the food produced was typically not meant for the locals, but for high-end restaurants in outer Hong Kong. According to the Wall Street Journal, 80% of fish balls, Hong Kong’s “ultimate gourmet delicacy,” were manufactured within Kowloon Walled City. According to former resident and Triad member Tang Kam-cheung, Kowloon Walled City was known for three things: opium dens, brothels, and dentists. Could you make it in the walled city? I’m 100% sure I couldn’t. Tags: chinese history, hong kong, kowloon walled city, overpopulation, urban planning. Bookmark the permalink.